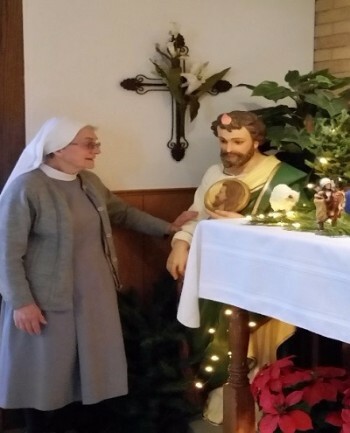 For many years, two near-life- size statues of Saint Terese, the Little Flower, and St. Jude were standing in the corner of a store room, startling me often as I went in to get supplies. With the consent of our two priests and the help of our strong maintenance man, both statues were brought up into the sanctuary where they stayed for a whole month as challenges (pro and con) to church-goers. Now, since the beginning of Advent, they flank the Altar of our Saints: Kateri Tekakwitha and Katharine Drexel (both canonized since the turn of the millennium). Now to the point: When I was touched to the heart with a severe problem—who does not have to face the one or other in the workplace, relationships or family?—I took it to St. Jude in desperation, though up to that point I had no special relationship with him. ”Now show your metal in this case for the glory of God, you staunch friend and emissary of Jesus, if it is true what I’ve heard and read about you, e.g. in old copies of the Trumpet Call, accounts published in thanksgiving for answered prayer. We need help speedily.” And THANK YOU, even as we are waiting. 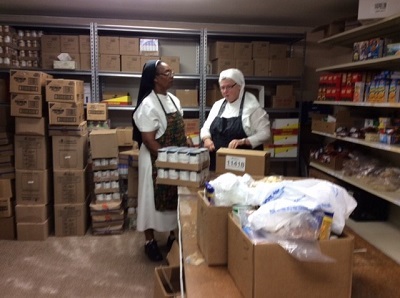 The past three months at the Mission were filled to the brim with activities. From friends and supporters donations in kind flowed in for St. Augustine school, for the food pantry in Walthill, the thrift store in Macy, and Christmas gifts for needy families, including 30+ new children’s bikes. Volunteers came singly or in groups for a day or a week at a time; fund raisers were attended, e.g. ‘The Three Irish Priests’ from northern Ireland; publication of next year’s calendar with our children’s portraits by internationally famous Fr. Don Doll, S.J., practice and performance of the Christmas program with new additions of sticks and bells, and then the Midnight Mass with Sr. Rita Marie from Norfolk as our organist. Sr. Madeleine, high school teacher at Bishop Heelan in Sioux City, took her family visit at this time. Sr. Cecilia spent a week of vacation with us, even her birthday on Christmas Eve. Sisters Deana and Jane were much on the go for outreach needs, making trips as far as Omaha, often with our volunteer, Jeff Foley. Sr. Frances decorated the church for Advent and Christmas with parishioners’ help. We thank our Guardian Angels, Saint Jude and all our friends and supporters as we pray for good health, peace and prosperity for all in 2017.